Our ranking at 13th in the Sunday Times HSBC International Track 200 is a significant achievement for Stage One. The international nature of our work means that our products, expertise and crews are regularly dispatched across the world, with recent months alone seeing us in Qatar, Milan, Baku, Singapore and Cannes. 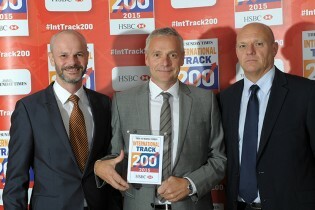 Hard work has gone into gaining increased recognition and respect in these tough foreign markets and the listing in the International Track 200 is a reflection of the effort put in by all our crews, both in the workshops at home and those abroad for long periods away from their families. Export is a hard and often risky business which does not always guarantee profit. Exchange rates, import duties, security bonds and carnets are just a few of the things that make doing business overseas more complex than at home. From a business perspective, the rate at which we’re commissioned for projects is unpredictable, making this achievement all the more remarkable. Our adaptability is what sets us apart from our competitors and never knowing what projects might come through our doors next is what makes Stage One such an interesting and stimulating place to work. We will be using this great news to drive new opportunities in new territories, consolidate growth and continue to further enhance our reputation.